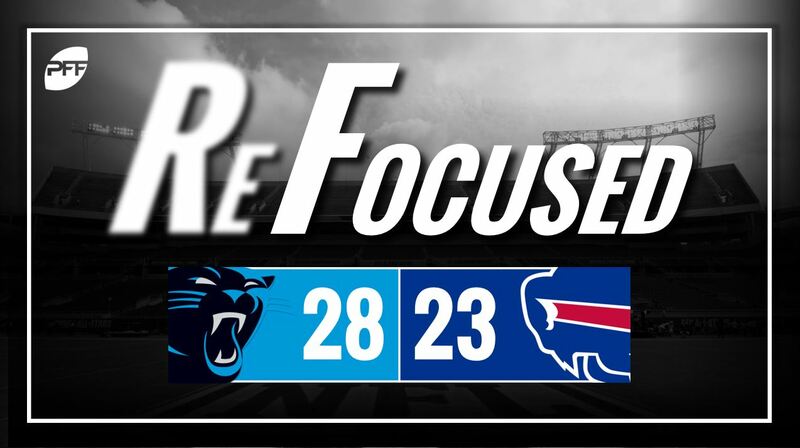 The Carolina Panthers defeated the Buffalo Bills on Thursday night, 28-23 opening the first full week of preseason action in the NFL. PFF’s ReFocused series this season features immediate takeaways and a key to the victory from two Senior Analysts who graded the performance, watching every player, on every play of the game. For more data and analysis from the game, utilize our Premium Stats 2.0 dashboard to expand your knowledge on the key players, signature stats and much more. Cam Newton and the first-string offense were solid if unspectacular today, but both of the Panthers young wide receivers, Curtis Samuel and D.J. Moore, had promising preseason debuts. Each finished with four catches and over 10 yards per catch. On defense, rookies Donte Jackson and Rashaan Gaulden combined for 57 fairly non-descript snaps. They were only targeted three times on the day allowing two catches between the rookie duo. On the defensive line, after contributing next to nothing his first two seasons in the league, Vernon Butler started showing flashes of why he was drafted in the first round. He had a few nice pass-rushes in 17 snaps in the first half. Nathan Peterman looked far more cool and collected in his first drive of the game than he ever did in a Bills uniform as a rookie. He was surgical in the Bills first two drives and didn’t throw a single off-target pass. On the other hand, Josh Allen may not have always been on target, but it was always coming in hot. He threw multiple passes that traveled 60-plus yards in the air although none were completed. In his debut, his legs were more impressive than his arm. Rookie Tremaine Edmunds was largely quiet in his Bills debut on defense, finishing the day with only one tackle. But their third-round selection Harrison Phillips had a nice day with two tackles and a sack of Panthers backup Garrett Gilbert. The Bills should be pleased and hopeful that one of their backup pass-rushers will be able to make an impact this season, with defensive ends Eddie Yarbrough, Mike Love and Ryan Russell harassing the Panthers’ backfield all day. Former first-round pick Shaq Lawson had less of an impact against the pass, but was solid against the run today. Buffalo: You want to see your starting quarterback look good in preseason – especially after last year – and Peterman did just that. He led two succesful drives and even though the stat sheet says he threw an interception, we all know it wasn’t his fault. Carolina: After the Panthers did not retain Derek Anderson, the backup quarterback position is wide open. Both Garrett Gilbert and Taylor Heinicke staked their claim tonight for the spot with some impressive throws, and most importantly, no turnovers between the two of them.